In my job, I seldom go outstation, but last Wednesday, my boss from Paris asked me to join him for a meeting with customer there. He was a very nice manager, the day before the meeting, he showed me through skype the direction from the metro station to the building where the meeting was held. So I woke up at 5:30am that morning to catch the train at 6:30am. Hubby was kind to send me to the train station. I slept the whole way to Paris, people around me were either working on their laptop, or reading. We arrived around 8:50am. From Montparnasse station, I had around one hour of metro and walk. As soon as I got out of the metro station, I saw the building my boss showed me, so everything went rather smooth. The meeting was carried on for around two and a half hours, then I was good to go. Since my return train was at 3:49pm, I could either go to the train station to change my ticket, or I could wander around Paris. I decided to go to the Malaysian restaurant. 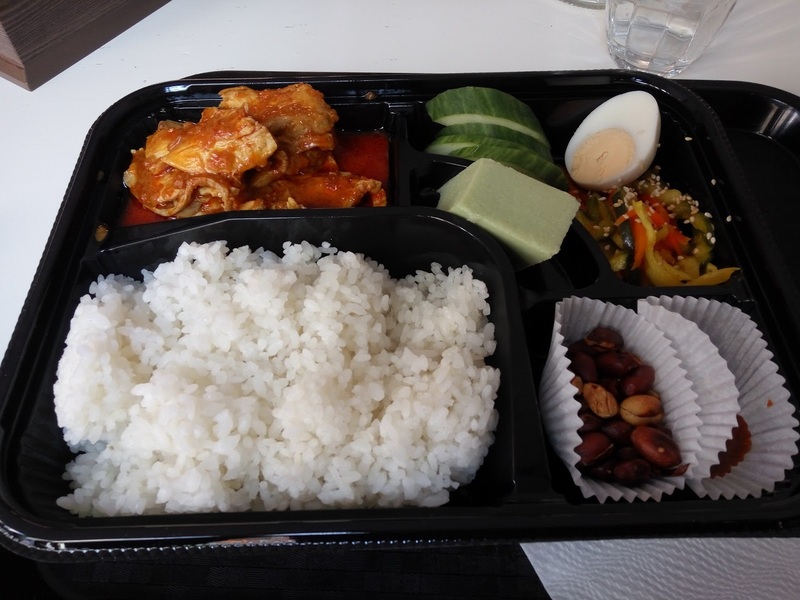 I arrived at 2pm, swallowed a plate of Nasi Lemak within 20 minutes, then off I went again as it took some time to go to the train station. Nasi Lemak set lunch at 14.80€ in the Langkawi restaurant. The taste was quite authentic. I waited around 40 minutes in the train station, then read through the whole two and a half hours. I got home at around 7pm, exhausted. Overall, I had 6 hours of transport for a meeting of less than 3 hours. I do not envy my coworkers who have to do this regularly. 1. When I was in Singapore several years ago, 90% of the metro passengers were on their cellphone. In Paris, I was surprised to see that only 50% were on their phone, 40% were on book or their metro newspaper. 2. In almost every metro I took, there was a beggar standing in the middle of the train, saying good morning, then trying to sell us stuff or getting money from us. They didn't seem to have accent so they were French. They were also beggars on the walkway between transiting entrance / exit. 3. At 9:30am, the trains were still full. 4. People do not offer their seat often to the elderly or people in need. At one station, there was a woman around 40 years old entering train. She saw that all the seats were taken, so she asked if she could have a seat. A young girl stood up and left her seat, the woman sat down then read her book. She didn't seem pregnant or in need of a seat, but she got it. I loooove nasi lemak! Gosh, now I'm craving Malaysian food. It was one of my best surprises of the trip we took there, I knew nothing about Malaysian cuisine and I think the world SHOULD know about it because it's delicious. Anyway, your observations are spot on. I haven't been to Paris in a few years but last time, phone reception was spotty underground, so it may be why people are reading newspapers.